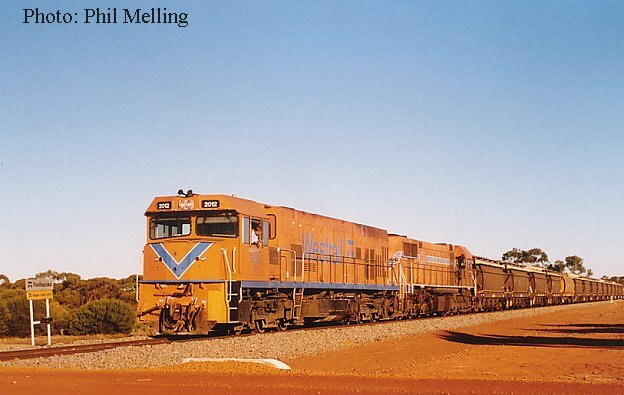 Although not strictly the correct title, we have called this page the Mullewa to Buntine Railway. In reality it is the Avon to Mullewa Railway but the section from Maya through to McLevie no longer sees trains run over it. 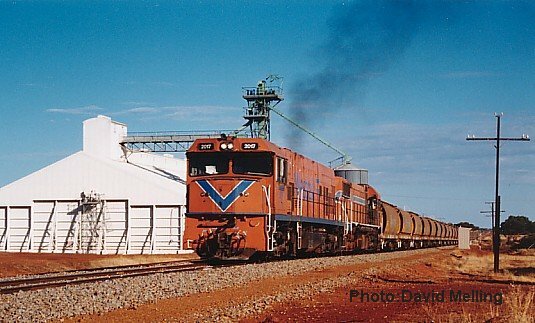 The Geraldton District ran through to Buntine, the Avon District ran through to Wubin, the section between Wubin & Buntine in the last ten years or so saw only occassional through trains. Avon trains now terminate at the CBH bin at McLevie. Geraldton trains at Maya. The Avon-Buntine Railway is used only for grain trains. CBH (Co-operative Bulk Handling) has grain storage and rail loading facilitiesat: Sullivan,Canna,Gutha,Pintharuka,Morawa,Bowgada,Perenjori,Bunjil,Latham,Maya & Buntine (the latter now road served). 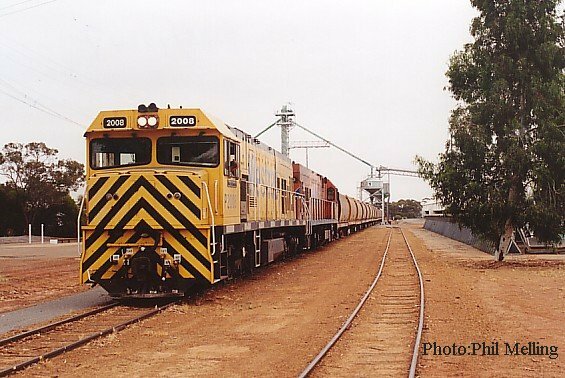 P2015/DA1575 shunt their loaded grain train at Pintharuka on 6 May 2000. AB1534 at Caron (south of Perenjori) on 14 October 2000 with the Four Wheel LA Ballast wagons, the flat top wagons are providing brake power. 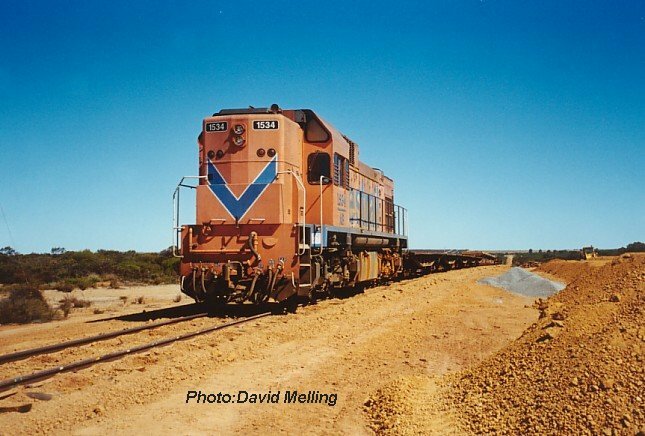 In years past Caron was a significant location in the Avon-Mullewa Railway with loco servicing facilities including the now sole surviving coal stage (Coaling facility) in Western Australia. Here P2010 is seen passing the coal stage on 5 January 1996. 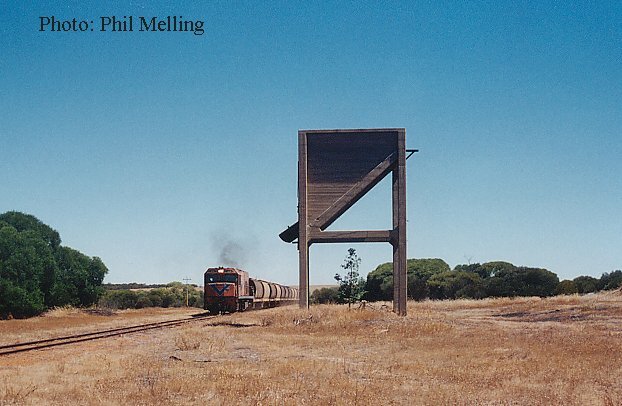 P2008+P2013 shunt empty wagons into the CBH wheatbin at Perenjori on 23 April 2001. The Perenjori bin is almost at right angles to the main line, interestingly the access is from the southern end of the yard and the trains enter from the north end.